Snow, freezing rain, and high winds are in the forecast for western Washington State this week. While that shouldn’t come as a surprise – it’s standard winter weather for most of the Pacific Northwest – there are always too many drivers who are caught off guard. The result is often a slew of predictable, often preventable, crashes. 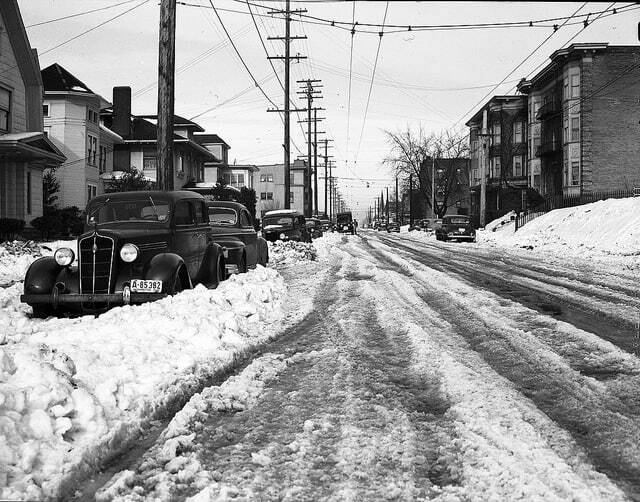 Cars snowed in on Capitol Hill in Seattle; photo courtesy of the Seattle Municipal Archives. One of the best things you can do to prevent a winter weather crash is to get your car ready to handle wet roads. Are your headlights and taillights all working? Do your tires have enough tread to handle heavy rainfall? How well do your windshield wipers work? Have you checked the levels of windshield washer fluid, oil, and anti-freeze? Do you need tire chains for snow? Also, consider stocking your car with supplies like emergency flares and thermal blankets. Hopefully, you won’t need them – but you won’t regret having them ready. Too many drivers exceed the speed limit just out of habit. Excessive speed is one of the major causes of winter weather crashes. You’re not going to save much time by speeding, and it’s not worth the risk of sliding off a slick road. Pay attention to the speed of other vehicles. Highway lane restrictions exist for a reason: speed differential is a surprisingly common cause of crashes. Even in heavy rain or snow, you will still find drivers going 80 mph on I-5—but that doesn’t mean it’s a good idea. Stay in the right lane(s), passing in the left only as necessary. In rainy or snowy conditions, the wet road surface means your vehicle needs extra stopping distance. This is especially important in heavy traffic or during your commute, when a few extra feet of space may be the difference between you getting home safely instead of heading to the hospital. will need 304 feet of stopping distance. Our law office is in downtown Seattle, right by Pike Place Market. Even in the best of weather, we see drivers speeding, blocking intersections, and disregarding traffic signals. The most effective way to avoid a winter weather crash in Seattle might be to take the bus. As this wintery weather hits Washington this week, please pay attention to the drivers around you. You might be the most skillful and attentive driver on the road, but driving in snow or sleet requires an extra level of defensiveness. We have seen too many injuries and deaths from winter weather crashes, and we want you and your family to be safe.